Liebster Award – Third (and Fourth) Time’s the Charm! In the space of a week I received two Liebster Award nominations – bringing my total to four. Four. In just over two months of blogging. I’d just like to take a minute and be very grateful for that. I know a lot of blogs are award-free zones, but I enjoy answering the questions and I’m proud of the fact that someone out there likes this little piece of the Internet that much that they want to share it with others. So, thank you. This is going to be a long post with 22 questions in total! Feel free to grab a cuppa before we get started! I was nominated by both A Fool’s Ingenuity and Marvel at Words. 1. What is your preferred reading format? E-book, paperback, hardback? I’ve talked about this before briefly here. I’ll always prefer paperback to eBook, even though they both have their place. I generally buy paperback and not hardback, but I like splashing out on a hardback from time-to-time for a series I love. 2. If you could only recommend one book, what would it be and why? Just one?? This is so hard. It would depend entirely on what the person likes, but I would always recommend Harry Potter to everyone, ever. It’s just a must-read. 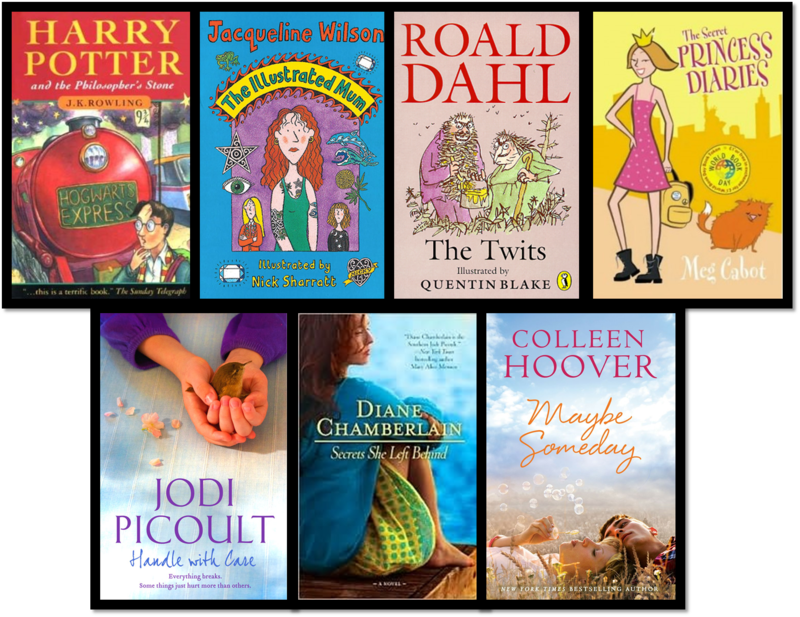 For kids you can’t go wrong with Jacqueline Wilson and Roald Dahl, for teens Meg Cabot, and I would imagine Jodi Picoult and Diane Chamberlain are always good “all-rounders” (especially according to me and Charnell at Reviews from a Bookworm). Colleen Hoover may also become a new favourite recommendation. 3. One of the recent themes of Top Ten Tuesday was: if you like this TV show/film, you should read this book. Provide a book recommendation based on your favourite film or TV show. Can I cheat a little?? I spent a decent amount of time on my Top Ten Tuesday post, and I really like the recommendations I made, so I’m going to link it up here, it includes books to read if you like The Big Bang Theory, Come Dine With Me and The Tudors. 4. Where is your favourite place to read? My BED. Without a doubt, if you need to find me, that’s probably where I’ll be; either blogging, reading, working or watching movies. My room is my space. 5. What is your opinion on commenting on blog posts? I think it’s a really important aspect of blogging. I wish I had enough time to comment more, but working full-time, studying part-time, reading, blogging and life in general takes up a lot of time. If a post is good, but doesn’t make me want to comment I try to “like” it where I can, usually on WordPress blogs because they have the “like” function. If I feel I have something to add or something I want to say, I take the time to make a comment, and I make every effort to reply to comments on my own blog. If someone has taken the time out of their busy life to write to you, you should at least acknowledge that. 6. What is your most anticipated read of 2014? I used to be aware of books due for release when I was younger (OK, mostly just the Harry Potter books), then I went on a bit of a reading slump for a few years through Uni. Since I’ve started blogging I’m more aware of books that are coming out, but the only one that I’ve wanted to pre-order so far is The Mortal Instruments: City of Heavenly Fire, which I should be starting soon. Edit: There’s a new Colleen Hoover book out in August – yus! 7. We all know about blogger hype, which book have you read which did not live up to the hype? I’ve seen some really good posts on this lately and wanted to do a discussion post on it myself. I call it the Hype Monster and it’s very real, people! I try to avoid hype as much as possible – I skim-read reviews for books I want to read and only read reviews once I’ve finished the book, a bit backwards, I know. The two that come to mind are The Rosie Project and… The Fault in Our Stars *runs away and hides*. I’d heard quite a lot about The Rosie Project, and I did enjoy the book, just not as much as I was expecting (read my review of The Rosie Project). As for The Fault in Our Stars, I read it at the absolute peak of its height. I still rated it 4.5/5* and I’m pretty sure if I’d read it pre-hype it would have blown me away. It was a great read, but because of the ridiculous Godzilla-Hype-Monster that surrounded it I don’t think it could ever have lived up to that (you can check out my full review read my review of The Fault in Our Stars). I’m lucky that I read The Hunger Games, The Mortal Instruments, Harry Potter and Divergent all before the hype exploded, so my opinions and love for those books hasn’t been affected (though they might on a reread!). 8. Name one author whose books you will always read. See question 2. And you could probably add Cassandra Clare and Julianna Stone to that list. 9. There are certain bloggers whose opinions I value, when they give a good review I will go out of my way to read that book. Name a blogger whose opinions you value and explain why? Ohh, tricky. There are lots of blogs I love to read for loads of different reasons, but when it comes to trusting reviews based on the similarities in taste between me and someone else – that’s a different question entirely! There are 3 bloggers who spring to mind – Ashley @ Nose Graze, Brandie @ Brandie is a Book Junkie and Charnell @ Reviews from a Bookworm. Ashley because of our shared love for Travis “Maddog” Maddox – if we can agree on him I trust her judgement. Brandie because we’ve had similar ideas about loads of books (including the fact we bonded over our love for a certain Mr Grey) and Charnell because even though we don’t always agree on the books we love, her reviews are really direct and usually very funny, and they’ve made me question why I love a book, which is always a good thing. 10. What is your favourite part of blogging? The book tours, the reviews, the memes, the community…? Definitely the community. I love discussion posts – so many bloggers have great personalities that come across in their writing and they’re always entertaining to read. I wish I had more time to write all the discussions I have in my head. That doesn’t sound quite right… but kudos people, I don’t know how you do it. Which is why I love memes like Top Ten Tuesday, they’re practically discussion posts but they’re on a specific theme where we can share ideas and opinions that are more directed and structured. I definitely felt that I became part of the community when I recently posted a Top Ten Tuesday in memory of my cat, Alfie, who we lost very suddenly, and the support from the bookish community was pretty overwhelming. 11. Where did your blog name come from? The “confessions of a” part was inspired by the book Confessions of a Shopaholic by Sophie Kinsella, and also because I realised a lot of bloggers don’t have people in their “real lives” they can share their crazy bookish-obsessed ways with – the good, bad and ugly, so talking about bookish obsessions on-line felt more like confessions! I’m regularly called a “geek” (in a nice way – I think!) because of my love of reading, the random facts I come out with, the fact I’m an eternal student, my love for TV shows, stereotypical “geek” movies etc. and so “Confessions of a Book Geek” was born. It actually took me quite a while to get here! I’d toyed with the idea of a blog for ages, around 6 years ago I made a beauty blog that lasted for a few months, and when I was at University I created a website/blog called PurplePR to document the variety of freelance work I was doing and to share tips and advice on business development and marketing with others, I still update this but it’s more for me than to interact with followers. Around 2 years ago I created a blog for my sister for her Interior Design Diploma (Anita Brown Design Studio) and it really took off. I began reading more blogs and stumbled upon some bookish ones. I had no idea Book Geeks had blogs all over the inter-webby-waves and my sister encouraged me to get involved by starting up my own. 2. What’s your favourite of your own blog posts? Jeesh, Tough question! I don’t actually think I’ve written my favourite yet! I have so many ideas for blogs I want to write but I’m swamped-busy at the minute. I’ll get round to it at some point. So far, my favourites are Amazon VS Hachette – who do you support? – because it was a discussion post I felt I really had to write and it’s the type of post I want to do more of, and my Author Interview with Shannon A Thompson because it was my first ever author interview as part of a new blog feature. 3. What’s your favourite word and why? 4. How long do you spend reading blogs each week? Too long! 😀 I probably spend more time blogging and reading blogs now than I do actually reading books. I use Bloglovin’ to keep it all under control and find that it works really well, I check it daily when I’m checking my emails. I probably spend at least 5 hours a week checking out blogs. 5. When is your favourite time to blog? In the evenings. I’m learning to schedule posts and find the weekends the best for doing this though, I’m still new to the idea of scheduling, and unlike many other blogging genres, book blogging seems to be much more structured and regular. I’ve recently found some great organisational tips on Read Sleep Repeat. 6. Why do you think people blog? For a ton of different reasons I guess. Because they have something to say. Because they have a passion that isn’t shared among their friends and family. Because they enjoy being part of an on-line community. Those are mostly my reasons. 7. How long does it take you to compose an average blog post? This one has taken a couple of weeks to answer! 🙂 On average I would say around half an hour. That’s to do the actual writing and linking up. It probably takes another 15 minutes or so to add images and gifs. 8. What do you think makes a good blog? Good question. I definitely appreciate a good design. I’d love to go self-hosted and have a design created for me by Ashley at Nose Graze. WordPress.com designs are pretty good but I think I struggle with making it look unique. I’d LOVE to be able to learn some design basics so I could do more imagery myself, but there just isn’t time at the minute! I love blogs that have good discussion posts, and I love a blogger with a great sense of humour and buckets of personality (I try to put my personality across on Book Geek but it’s hard to know how well you’re doing when you read back your own work!). I also love blogs that have features and posts other than reviews, and I’m a sucker for gifs and images to break up chunks of text. 9. How do you find new blogs to follow? I generally find new blogs through memes and links on blogs I currently follow, or when people follow me I tend to go and check their blog out, then add it to my ri-donk-ulous Bloglovin’ list. 10. Would you ever stop following a blog? Why? 11. When do you find it most difficult to blog? All the time! When I first started blogging it wasn’t so bad but I have a lot happening now and I need to actively make the time to blog. In fact, I’m sure this is the same for most bloggers – we have lives, partners, work, school, university, families, other hobbies. It’s a real achievement that we manage to post at all and we should give each other A LOT more credit for it. If you made it to the end of this post – thanks for sticking with me, I’m sending you Book Geek hugs and kisses. I’m going to make a few nominations to blogs I think need more recognition, Liebster Awards are intended for blogs with less than 300 followers, but it can be tricky to work out follower numbers! To those I’ve nominated below – feel free to answer any or all of the above questions, or to ignore this award entirely! To those I haven’t specifically nominated – feel free to answer the questions and link below so I can read your answers! Okay. So I have so much I want to respond to in this post, but first things first, Hi! Now, I love the idea of calling hyping a book the Hype Monster, and I’m totes stealing that terminology! Also, I discovered so many new blogs to read from this post. I currently have over a dozen tabs open on my web browser, and I will read them all! Also also, I noticed you would like to learn more about designing on WordPress and just websites in general, I’m assuming. So, I thought I’d tell you about a website I’m learning with called Treehouse ( teamtreehouse.com I didn’t do a direct link because that seemed spammy). You can learn a lot there when you have the time and a little money. Anyways, GREAT POST! Hi! 🙂 Thanks for your comment – when I spotted it this morning I settled down with a coffee for a good read! I really want to do a post on the Hype Monster! I will, I need an extra day in my week just for blogging, but I will find the time to do these posts someday! Also, the terminology is officially on-loan to you, you read it here first! Haha, I’m so glad you’ve found new blogs! I’m going to do a “Share the Love” post soon that breaks down the blogs I follow and why I follow them. There are many more I love than those mentioned in this post – but they were mentioned for a specific reason. I’m always afraid I’ve left people out! My bed is my favorite place to read too! Yay! I really enjoyed reading your answers. I find other people’s views on blogging so interesting, because i still feel so new and isolated from the community of it (one and a half years after starting!). And i didn’t even know about Bloglovin! That will make my blog reading life so much easier. I will try to get my post up in the next couple of days. I think I’ll tailor it down a bit, as 22 questions is A LOT and I also answered some of these in my previous Liebster post (so I’ll just link back to that). I commented on your review. 🙂 I am glad you still liked it despite the Hype Monster. I just love Don. I wish I could hug you – thank you SO much for mentioning me and my blog in your post. I really enjoy your blog – it is one of my favorites that I follow and your posts are always must reads for me. I really appreciate that you follow me and read my reviews. And I love that we have similar tastes in books (as was proven when I just read your Top Ten Summer TBR list!). I use Bloglovin, too and find that I am reading blogs and commenting more than I get to read and I need to balance that out more. Your Amazon vs Hachette post was one of the first posts I read of yours and I loved it. I had no idea really what was going on and you put everything in perspective for me. Love Big Bang! Favorite show right now. Hahahaha I’m sending you bloggy hugs and inter-webby kisses! I’m really glad you enjoy my posts, I’ve only been doing this for three months, and I sometimes wonder if people like what I’m doing up in here. I have those blogs where when I see a update on Bloglovin, or I get an email about a new post, and I’m all “stand-back, there’s a new POST! !” and I would be over-joyed if someone felt like that about lil old me. I really want to dedicate more time to proper discussion posts like that one when I get the chance, at the minute with work and a part-time Diploma I’m barely finding the time to breathe, but things should settle down a little soon (exams are in 3 weeks) and then I can concentrate and schedule a few really juicy posts in. I am glad you enjoy my reviews. I like yours for the same reason, they give me a proper insight into why someone would love a book that I really didn’t. It’s made me hate books a little less 😉 I am probably far too direct but I don’t know how else to be, haha. My bed is my all time favourite place to read as well, it’s definitely where I get most of my reading done. Definitely agree that blogging helps me get across my crazy bookish ravings to people who actually understand and know what I am on about. I don’t really have anyone in my day to day life who’s really enjoys reading or reads regularly. I don’t use Bloglovin’ nearly enough, it’s probably really useful for checking out blogs. But, if I am honest, I follow far too many! Even ones I probably won’t go and read ever again but I’d feel terrible for unfollowing them, especially if they follow me. Is that bad? I don’t know, I might try using Bloglovin’ more instead of trying to remember the blogs of everyone I like to visit -I always end up forgetting someone and feeling even worse. I am trying so hard to schedule posts but never seem to find the time any more. I am going to Ireland for 4 days on the 30th and still haven’t got that weeks blog posts scheduled. I try at the weekends but those are really busy at times. I am definitely an evening blogger, that’s probably when I do 95% of my blog posts/blog visits and everything else. Great answers & congrats on all the awards!! Haha I’m glad I can reduce the hate! I appreciate your direct-ness, sometimes I WANT to be more direct but I think I’m so used to writing for corporate publications that I keep it more PC. I need to remember it’s my blog and I can cuss if I want to. I’m working on it… My mum and dad are big supporters of reading, but only very specific genres, and they reread favourites until they can quote chapters of it. My sister goes through notions of reading but it’s not the same thing – she will read the odd book, I want to read ALL the books. I’d say they are average readers as opposed to Book Geeks. I don’t know where my love of reading came from. Mum used to joke that as a kid I was hard to entertain – I was in to everything, wanted to know everything, soaked it all up like a sponge and still wanted to know more, so she used to take me to the library so I could loan books for the week to give her head peace! I have friends who read from time-to-time, but they wouldn’t understand the excitement when book 6 in TMI series lands on your doorstep the day of release! I rely on Bloglovin these days to keep tabs on the blogs I follow. I don’t read every post – I generally don’t follow WWW posts because I struggle with my TBR as it is without trying to keep up with what publishers are releasing, so I mark those as read. I don’t read all reviews either – if it’s a book I’m not into I’ll mark it as read, if it’s a review for a book I’m reading or plan to read I keep it unmarked to read it when I’m done with the book. I did feel a little bad for unfollowing a couple recently – but really if I’m not interacting with the person, or reading the blog, it makes no sense to follow. I don’t unfollow lightly though, there needs to be a really good reason. I’m pretty sure I don’t follow everyone who follows me either. I tried to at the start, but recently someone commented on my blog and I went over to their site and spotted that I was in their blogroll and they’d name-dropped me in a previous post and I didn’t even know! Bloglovin removes the guilt of forgetting for definite – I like that about it too. I’ve dipped my toe into the scheduling waters. The most I’ve scheduled is a week in advance. When I’m done with my exams soon I plan to schedule more in properly and make an ARC spread sheet to get through my backlog and take it from there. I think you need to dedicate a good bit of time to scheduling at the start and then grow it so that it becomes an aid rather than another time-consuming blogging problem! Where are you going in Ireland?? North or South?? Evenings are my time generally for doing everything. I’m such a night-time person, TV shows, reading, writing – all better at night, which isn’t so great when it comes to getting up in the morning!